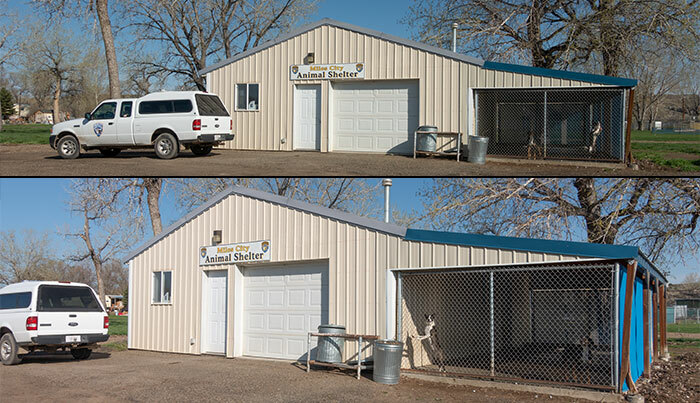 Miles City Animal Control is manned with one full time enforcement officer in 4.5 squared city limit miles that enforces city animal ordinances, Montana Code Annotated, county ordinances and the occasional livestock laws. The Animal Control Officer gets help from 16 city officers and 4 Custer County Sheriff’s deputies that are on working rotational shifts when Animal Control is not available. The Miles City Animal Control provides services for the City of Miles City and is contracted with Custer County for calls on demand with the resources available by the Animal Control Officer for the 3,783 square miles that encompasses Miles City. Our goal here at the Miles City Animal Shelter is to provide a safe and healthy place for animals until they can be returned to their owners or adopted out through the programs provided by the shelter. Animal Control is dedicated to providing the best possible service to the citizens of Miles City. The Animal Control unit was created as a result of this dedication to the public. City leaders recognized long ago that without providing local animal care and control services, Miles City’s residents needed to be served by a system that has resources to deal with animals to provide the level of service that is needed by Miles City. Animal Control responds to a variety of calls including dogs barking, loose animals, animal cruelty cases, injured animals, and a host of other situations involving domesticated and wild animals. 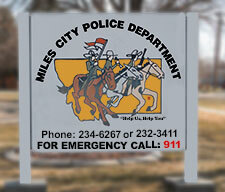 Miles City’s Animal Control Officer is authorized to investigate and enforce city codes pertaining to animals. Our Animal Control is dedicated to providing humane treatment for all animals in their care. Purpose: The purpose of Animal Control in Miles City is to educate the public regarding responsible pet ownership and enforcing animal ordinances. We perform a variety of services that help animals as well as the public: rescuing injured or sick animals, controlling stray and potentially dangerous animals roaming at large, removing stray dead animals from private and public property and transporting lost pets to the animal shelter where their owners are unable to reclaim them. The Animal Control officer is in action handling many routine, as well as emergency situations with pets and wild animals. One of the most important things that we do is to investigate animal bites. Animals that bite are quarantined and placed under observation to make sure the threat of rabies does not exist. Other situations which we investigate are animal cruelty and abuse, complaints of animal noise annoyance (barking dog), unsanitary conditions, and abandoned animals. Should I vaccinate my animal? Regardless of the animal’s lifestyle, Miles City requires that all dogs, cats over the age of 6-8 weeks be vaccinated against rabies. The primary reason is to prevent the spread of rabies. Rabies, while not currently widespread, is still prevalent in the wild and a threat to domestic pets. You’ve lost your pet, what do you do? The first thing to do is search your surrounding neighborhood. Second is to notify animal control. It’s recommended to contact local veterinary facilities and shelter. Dispatch has a lost/found animal form you can fill out by going to the dispatch office. Doing this greatly helps them out by freeing up phone lines for emergency use. What can we do about feral cats? Animal Control will trap feral/free roaming cats for residence. Animal control encourages citizens with feral cat issues to utilize there live trap check out at the shelter. This is also a time saving measure for animal control. The property owner that has the feral cat problem can monitor the use of the trap during hours that they see fit for trapping. Barking Dogs: For a dog owner to disturb another resident’s peace by allowing their dog to bark excessively and unreasonably. It is not a violation for a dog to bark. It is only a violation if the dog is barking loud and continuous. Any Officer who personally observes excessive barking can issue a citation to the owner. If our investigation of a barking dog does not result in such an observation, we will continue to respond to subsequent complaints in an attempt to observe the violation. Deceased Domestic Animals: Every attempt will be made to contact the owner and we will notify local Veterinarians. We will retrieve and transfer the animal to a holding area for 48 hours. If the animal is not claimed it will be wrapped in a plastic bag and the remains will be transported in a humane way to a landfill. Running at Large Dogs or Cats: Any Dog or Cat, retrieved will be held at Miles City Animal Shelter. Every attempt will be made to reunite the animal with its owner. All expenses incurred will be the responsibility of the owner. If not claimed, the animal will then be available for adoption. If the animal is not adopted, it will be taken to another adoption program that is more widely available. Rabies (Carrier) Animals: (Skunks, Raccoons, Foxes, Bats, Ground Hogs, Coyotes, Feral Cats, and dogs.) Rabid animals trapped in the township will be dispatched. Any of these animals found at large in the township that appear to be sick or infected will be dispatched. If a rabid animal is suspected of having contact with another animal or human, it will be processed using guidelines from the Health Department. Rules and Regulations relating to Animals can be found on the State of Montana Administrative Rules. Please click to view the City of Miles City Animal related ordinances.